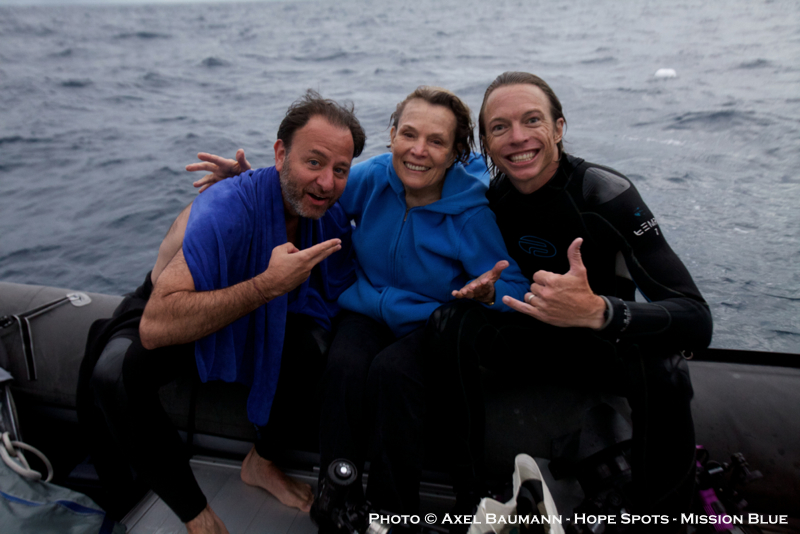 May 2013: The Mission Blue film crew and Dr. Sylvia Earle left port from Cairns, Australia to explore and document the remote Holmes and Osprey Reefs in the outer Coral Sea (over 250km offshore mainland Australia) – with a planned stop on the Great Barrier Reef on the return trip in. Heavy winds and weather restricted us to the seldom visited Holmes Reef for the majority of our trip. The water quality was incredible at Holmes, but the poor health of the corals and shortage of fish life left a real concern. Some have blamed the weather and cyclones for the coral die off – but even with the minimal time we had there, we were surprised at our how much of the area seemed to be struggling overall. We did see some healthier corals (in water deeper than 25-30 meters) as well as the occasional snapper and grouper cruising by – but not in any abundance. Sharks (Silvertip, Gray Reef and Whitetip Reef) were present, but in lower numbers than expected. Holmes was also home to a good population of fearless boobies and gannets – who take residence on the only sand spit in the area. We spent our last day on the Ribbon Reefs of the Great Barrier Reef. We found an incredible spot in Steve’s Bommie, which was loaded with life – so much diversity, abundance and high end predators present. Ironically, we were expecting to find the more healthy system farther away from land at Holmes Reef, but the more thriving reef of the trip turned out to be on the inside, closer to land, where the area is more protected from outside pressures.